Rubber Room Ramblings: LITTLE BLACK DRESS! Who doesn't need atleast one little black dress? 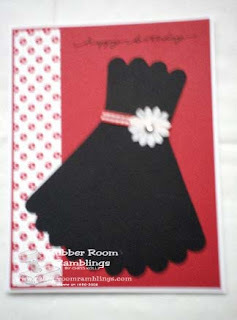 I love this pattern for making a dress with the Scallop Circle Die; how clever! I accessorized this dress with some gingham ribbon, a flower from the Pretties Kit and a clear rhinestone brad from the Pretties Kit. I used just a bit of Real Red Pattern Paper to add some texture to the card. We'll be making this card at the Triple Play Club in June!